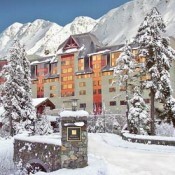 For the destination skier, lodging in Girdwood is limited to the four diamond Hotel Alyeska. Outside Alyeska and along the Seward Highway, lodging can be found south of the Tesoro gas station. BUT this lodging is about 20 miles from the ski resort. Lodging about 30 miles north of Alyeska can be found in Anchorage. Here there are enormous opportunities, but a favorite of Sports America is always the four diamond Captain Cook. If you really want to get adventuresome with your Alyeska ski vacation, spend five nights at the Hotel Alyeska and another couple of nights at the Captain Cook. Packaging for this trip would require calling the Sports America reservation department.